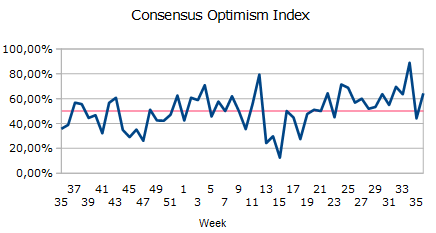 Forex Consensus Optimism Index, 2013, Week 36 | Vision Capital M - Investing With Knowledge. And Style. Vision Capital M – Investing With Knowledge. And Style. This week’s analysts optimistic expectations are a bit above the middle of the range (64%). This is about 45% higher than the previous week’s optimistic expectations. Consensuses are more optimistic for the European data (75%) than for the U.S. one (56%), with the positive economic expectations for the U.S. increasing faster (144%) than the ones for Europe (31%). Generally, this would be in favor of the USD due to the positive correlation between a positive economic data and the expectations of FED’s tapering. The correlation between the last 4 week change in the overall optimistic expectations and the change in the EUR/USD rate for the respective weeks has been positive for the last five weeks and now stands at 0.96. This is a rather high value which presents room for negative surprises. The following graph would come handy if we decide to further examine a possible relation between analysts’ expectations and the EUR/USD exchange rate. It presents 5EMA and 10EMA of the correlation between the change in consensus optimism for the each of the last four weeks and the respective weekly change in the EUR/USD pair. We see that currently the correlation between the change in optimism and the change in the currency pair is positive (EMA5 = 0.69, EMA10 = 0.41). Moreover, that uptrend continues. It may try to change its direction but currently a positive change in analysts optimism is related to a positive change in the EUR/USD exchange rate. Which comes to show that the current downtrend of the euro might be to a great extent due to market participants expectations that good economic news (represented by the analysts optimistic consensuses) would lead to rather sooner than later tightening of FED’s monetary policy. Still, one should keep in mind the rather high value of the non-smoothed correlation, whose current value of 0.96 is close to its upper limit. This means a change in the correlation trend could be close. If such a change happens, positive economic data could start causing euro increases again. Our Consensus Optimism Index (COI) measures the proportion between the optimistic analysts expectations and all expectations, including pessimistic. 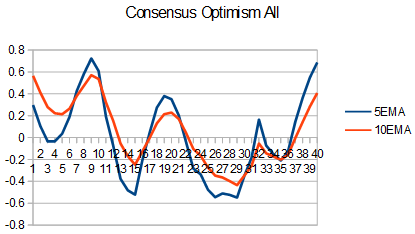 A value above 50 would indicate that the consensuses show a more optimistic than pessimistic picture. Generally, the change in the index could be used as a tool to assess EUR/USD exchange rate market mood. It should be noted however, that the rate rather moves on the real data, or on the difference between the real data and the expectations, i.e. positive or negative surprises. Open your real trading account at FXCM. Or test their opportunities and trading program with a 30 days FXCM demo account. Find out more information about FXCM leading the way. COI, dollar, economic data, euro, FED, forex, forex market, FOREX sentiment, forex trading, fxcm. No Imminent Rate Hike Next Year? For quick inquiries, please, use the form on the left. For more contact options, please check our "Contacts" page. Whether it is an educational question or you would need more information about our services, we will try our best to help. Feel free also to tell us what you think of our analysis and financial researches. Your opinion matters. All the analysis presented by Vision Capital M on this website represent personal opinions of their authors and are not and should not be regarded as a recommendation, offer or solicitation to trade in any way. They are not a personalized or any other form of investment advice. Investing and trading involve risk and may not be suitable for every person or entity! Past performance does not guarantee future results! For further details, please read the Disclaimer!